Posted on September 14, 2018 at 1:16 am. Because they have a hard, smooth surface tiles tends to be easy to clean. But the grout between tiles is a different matter. 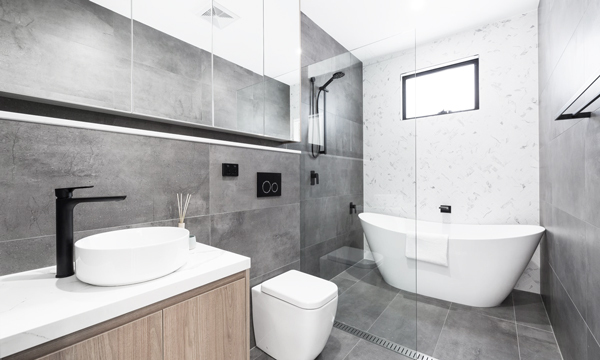 Grout is porous, and in the humid and sometime hot conditions of a bathroom grout can easily harbour mould and mildew. This is a good method for removing the surface dirt, scum and mould from between the tiles. This is a natural cleaner. Make a paste of baking soda and water and spread it between the tiles. Leave this for a few minutes. Mix white vinegar with water (half and half) and spray it on the grout still covered in baking soda paste. Leave this for half an hour. Mix ½ teaspoon of lemon oil with ½ cup of borax, then add some liquid soap. Use this paste to scrub the gout between tiles. If there is still discoloration in the grout then spray on some bleach, wait a few minutes, and scrub with the hard bristle brush. Make sure the bathroom is well ventilated when using bleach. Avoid fumes. Bleach is best for spot cleaning the grout. There should be no need to cover the entire tiled wall surface.